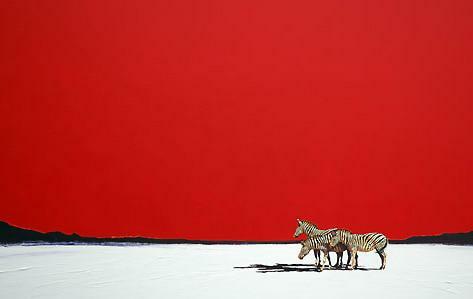 My favourite artist is Ian Van Zyl. He is local (from Umhlanga Rocks) and gets his inspiration from traveling for long periods of time in the country I spent most of my childhood years: Botswana. But, that is hardly the reason I have aspired for years to own one of his artworks. 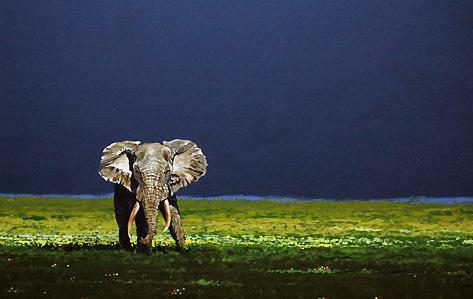 He depicts wildlife in such a true and clear way. All I have to do is look at his art and my heart aches for the wide open spaces and serenity of the ‘bush’. This is what I love. Not only is the mood of his paintings captivating for me but he paints my favourite wildlife animal: the Zebra, with emphasis on what I love most about it: the full round bum, the strong contrast of the asymmetrical stripes, the soft rounded head and the gentle eyes. I think they are the epiphany of Africa. Even more, I adore colour and he embraces it making it a feature in his art. 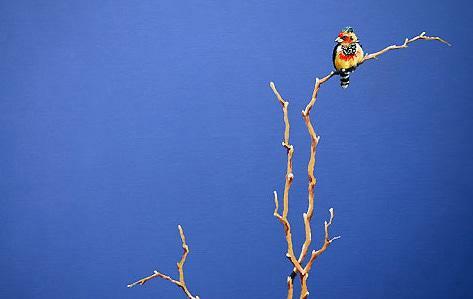 He does not shy away from strong colour’s as most wildlife artists do. His works are mostly in oils and I one day want to own an original. However, I will have to do a lot of saving for that. 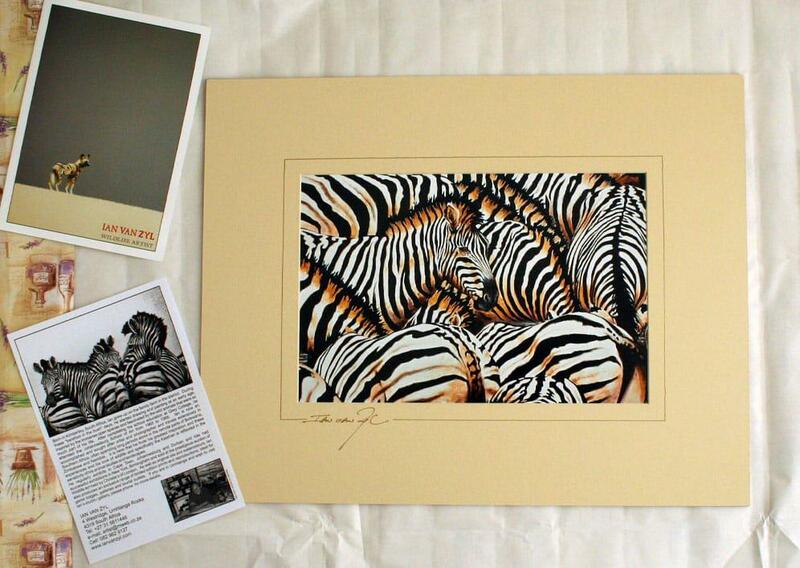 This is why I am so excited: as a belated birthday present from my Aunt and Uncle I received a signed A3 print of one of his Zebra paintings. This is such a special present as now I own a part of an Ian Van Zyl painting. 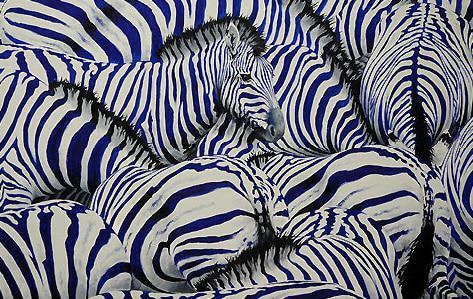 This entry was posted in Blog and tagged African Wildlife, Artist, Botswana, Ian Van Zyle, oil, print, South African artist, Wildlife artists, zebra. 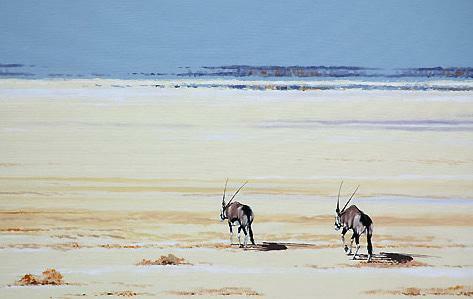 Wonderful pictures of the artist Ian van Zyl. The coloure of the Zebra is nice to see. Your post is very interesting and it sounds like a fantastic childhood in Botswana, Wendren!Have a nice day! That one of the elephant is my favorite. The colors! OH!!!! The colors!!! Just gorgeous. I really enjoyed this post! Ian is my Dad, he is my hero, the best dad in the world…. I am so lucky! When I was little, he used to illustrate all of my birthday invitations, build me the most incredible doll houses, and even taught me to play the piano. We used to own a farm close to Ixopo, and I spent many idyllic summers there with him walking around the bushvelt, learning about everything from how to tell a male and female Zebra apart just by looking by their stripes, to how to tell which type of grass the cattle prefer to eat. His stories about growing up in Kimberly are so interesting and funny too. What a lot of people don’t know about him, is that he works tirelessly behind the scenes for many charities, supporting wild life organisations, and young struggling artists. He is as generous and compassionate as he is talented. Phew, sorry about the essay! I just love seeing nice things written about my dad, it makes me feel so proud. Thanks for the lovely blog. I am creating a facebook group for him shortly, will pop the details across to you when I set it up.